“November is auspicious in so many parts of the country: the rice harvest is already in, the weather starts to cool, and the festive glow which precedes Christmas has began to brighten the landscape. " — F. Sionil Jose, Filipino writer. 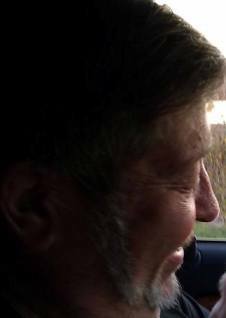 Bruce Clifford's song lyrics are "Over and Out" and "The Limit" for this month. Bud Lemire has two poems, "I'm Afraid of Needles" and "Tennis Elbow." John I. Blair sent three new poems: "Beneath My Feet," "Like A Tiny Dinosaur," and "As Days Grow Dark." One of our laid back authors Mark Crowder (he sometimes writes as Lexie, the cat, sometimes as Rabbo, the super rabbit) researched and prepared "For the Fallen" an Armistice Poem written at the close of WWI in 1914, Source: The London Times (1914) ©1914 By Laurence Binyon. 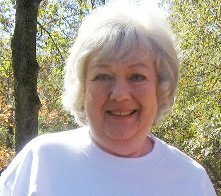 Linnie Jane Joslin Burks, late aunt of your editor and the author of the column "Armchair Genealogy" left many poems along her way while serving 32 years as a Southern Baptist Missionary with her husband Dr. Edgar Burks in Nigeria. Four of those poems found their way for this issue: "She Loved Me," "On President Kennedy's Funeral," "Snow," and "My Work," the latter the true focus of her life. Marilyn Carnell with aplomb, tells of her Driver Licenses, for several different states, not always the easiest task. Melinda Cohenour's "Armchair Genealogy" adds to the tale of the Traitor, Benedict Arnold V, beginning to tie into family origins of her own. Thomas F. O'Neill in his "Introspective," reveals an early friendship with an amazing celebrity, and how it helped shape his future. Judith Kroll aka Featherwind uses her "On Trek" column to emphasize "Lovelights," and includes an eye opening photo for which she penned a few lines. "Cooking with Rod" by Rod Cohenour introducing a Chocolate Raspberry Mousse, a stunning and delicious addition to his repertoire. Mattie Lennon's "Irish Eyes" subtitled "Scalpels, Skulls, and Rigor Mortis," blends reviews of a couple of recent publications and their authors with a few jokes and a personally pleased announcement. LC Van Savage "Consider This" recalls an uncle who was "A Veteran" and how he coped being home again. She also has one of the articles, in which she tells about "Hallowe'en Then" and the many differences from today. 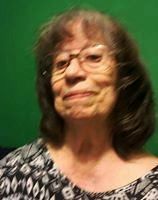 Bunny Dunn graciously gave permission to print her tale "My Experience with a Possessed Person" which has echoes of a Halloween type encounter. 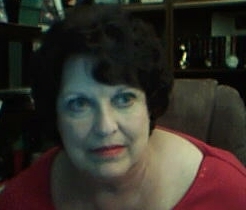 Many readers may recognize this author as being one of the leading chatters in the former chat site based in Switzerland, "SpiritWeb Org • An Approach of Spiritual Consciousness, Spiritual Web Chat" hosted by Rene (TheFire) . Thanking our webmaster Mike Craner without whose patience and expertise this ezine would not have been in its 21rst year, is a heartfelt appreciation. 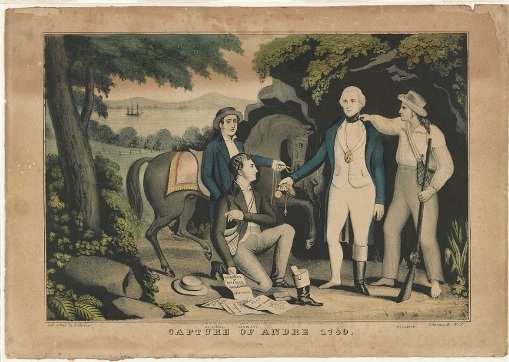 Last month, we began the exploration of Benedict Arnold’s military career – one that led both to great admiration from General George Washington and to eventual disgrace as America’s most infamous traitors. This month we shall attempt to understand the forces at play in his life. We shall also trace the distant relationship of Benedict Arnold to our family. Through his Westcott ancestral line, we may ultimately find a closer relationship than now known. In his first outing in command of troops in March of 1775, Benedict, as Captain, commanded a unit tasked to gain control of Fort Ticonderoga. Although successful, we find our young Benedict was frustrated after losing his personal battle with Ethan Allen who had marched from Massachusetts with his rowdy troop of Green Mountain Boys. This was a militia unit formed in the 1760’s in a back area bounded by the British provinces of New York and New Hampshire, an area which would later become the State of Vermont. It was a family affair with units commanded by Ethan and by members of his extended family. The troops held deep ties and loyalty to Ethan Allen’s family and to him, personally. The enmity between Ethan Allen, his related commanders, and Colonel James Easton was but one festering wound upon Benedict Arnold’s soul. He may have found quick satisfaction in manhandling Colonel Easton, but that was short-lived. The two strong-willed and bullheaded men, Allen and Arnold, would begin planning the first assault on British troops garrisoned in Canada. Meanwhile, Fort Ticonderoga was being held by their dual command. “Easton returned from his mission to Massachusetts while Arnold and Allen were planning the Canadian Invasion. Easton had done his best to diminish Arnold's participation in the capture of Ticonderoga and the two were arguing once more. The hot-tempered Arnold soon had some more people to fight with: Connecticut governor Johnathan Trumbull appointed Colonel Benjamin Hinman to command the Fort. Ethan Allen relinquished his command. Arnold did not, instead threatening to sail two ships under his command directly to a nearby British outpost and surrender them. Hinman then enlisted the treasonous Arnold's soldiers, took command of his ships, and dissolved his command. Completely affronted, Arnold went to Albany and there sent off a statement of the situation at Ticonderoga to the Continental Congress. Here we witness the first evidence of Benedict Arnold’s thought process which would presage his ultimate treasonous acts. In a fit of pique, rather than think calmly and enlist the aid of those who actually respected and supported him, he rashly threatened an act certain to bring down wrath upon him. We now know that upon returning home, Benedict would learn of the death of his young wife. Coupled with the anger still fomented by his embarrassing and frustrating confrontation following his successful taking of Fort Ticonderoga, was the anguish of his deep personal loss, topped by the inability of the Continental Army to remunerate him properly for his personal expenditures in support of the cause. The Massachusetts Committee of Safety repaid him only a small portion of his total bill, nowhere near the total. It would be some time before he was fully recompensed. General George Washington had been much impressed by Benedict Arnold’s daring actions and saw value where others merely saw arrogance. He let it be known he wanted Benedict to take a commanding role in the campaign which would be led by Gen. Philip Schuyler. Benedict’s long years of trade with the Quebecois made his knowledge of the people and the terrain valuable. In advance of the trek Benedict Arnold sought to gain some knowledge from a long-time acquaintance, John Dyer Mercier. Mercier made a most unfortunate decision. He handed off Benedict’s letter to two Abenaki tribesmen who were in concert with John Hall, a French-speaking British deserter. Somehow that letter fell into the hands of the British command who, now alerted to the impending invasion, had time to buttress their garrison. The entire campaign seemed fated from the start. Of the 1,100 troops marched northward by Arnold, only 600 made the trip due to the horrific cold of the winter, disease, and starvation. Upon arrival, they found a much larger defense amassed in advance. The weather also did not help. Rain poured down upon the troops, a cold and chilling rain. Montgomery was killed, Benedict suffered his first leg wound, and Daniel Morgan was called upon to salvage what he could of the effort. In spite of Morgan’s heroic efforts, the Americans were ultimately forced to surrender. From his sickbed, Benedict refused to surrender – “bellowing commands” to his troops, not merely reluctant but determined not to leave absent triumph. It was to no avail, but word of his actions reached Washington who marked this up in his favor as well. Washington named Benedict Arnold the rank of Brigadier General. Benedict Arnold was mounting up enemies among the officers with whom he would be tasked to fight the cause of America’s revolution. The very attributes which made him a strong commander in battle were negative faults in his personal interactions. These feuds would cost him a most desirable promotion to Major General. While he defended multiple complaints brought by his peers and senior officers, Benedict watched junior officers being promoted ahead of him to Major General. He was embittered. Once again, his admirer and defender, General George Washington, would intervene behind the scenes to investigate why he had not been consulted in connection with the promotions handed out by Congress. This promotion, however, was granted without the seniority both Washington and Arnold felt he deserved. He would be standing in an inferior capacity to many junior officers who served under his command previously. He sent a letter of resignation to Washington. Washington, unbeknownst to Arnold, was working behind the scenes to secure a position of command on a second Siege of Montreal. He refused Arnold’s resignation, instead placing him in a substantial role in the second Siege of Montreal. When he learned of this opportunity, Arnold asked to put his resignation on hold. He immediately took off for the north. On August 8, Congress voted not to reinstate Arnold's seniority and he would never forgive them for the slight. Arnold exhibited an innate strategic sense in battle. He crossed horns with Generals Schuyler and Gates on more than one occasion, even when his tactical plans were accepted and proven successful. Again, the hostility he faced reared its ugly head when his contributions to both strategic plans and tactical execution failed to be mentioned in the official reports to Congress. He exhibited bravery on more than one occasion, even when injured. These efforts failed to be recognized by those whose disapprobation of him surmounted any level of respect they might otherwise have felt. Even though Arnold’s seniority was later restored, the damage had been done. He was now forever lame, had been discredited by his superior officers, ignored by members of Congress, and was now a widower with young children and felt the sting of being alone to raise them. He returned home with enmity in his heart. While recuperating from his wounds at his home in Philadelphia, 38 year old Benedict met and began wooing Margaret “Peggy” Shippen, the youngest daughter of Judge Edward Shippen. A mere 18 years of age, Peggy was vivacious, strong-willed, and deeply involved in the Loyalist’s cause. They wed in April of 1779. 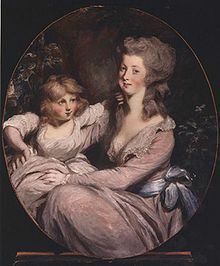 Peggy Shippen Arnold and daughter Sophia, by Daniel Gardner, circa 1787–1789. The Shippen family was upper crust society, wealthy, educated, and well respected. Arnold was once again thrust into a life of social status, but without the means to support the lifestyle. He, once again, resorted to the old street savvy ways. He engaged in real estate speculation, a capital-intensive industry. In support of his needs, Arnold began utilizing government assets as his own. He used his position to approve the use of a ship and later invested in it in clear contravention of propriety. He was brought up on charges and court-martialed in June of 1779. By this time, he had already begun negotiating with the British to sell military secrets and to use his position to weaken the defenses of West Point. He had been given command in spite of his peer’s opposition. Now he bartered that command for filthy lucre! Through the intermediary Major John Andre, a friend and possible former lover of now wife Peggy Shippen Arnold, Benedict funneled information to the British in return for money. He even gave vital information on the movements of his old mentor George Washington. “Arnold defected to the British and received substantial remuneration for his defection. These included pay, land in Canada, pensions for himself, his wife and his children (five surviving from Peggy and three from his first marriage to Margaret) and a military commission as a British Provincial brigadier general. William "P.R." Joslin (1757 - 1846)Son of William (of Deerfield) Joslin Col. Your author and her siblings - the four Daughters of Lena May Joslin Carroll. Interestingly, our relationship to General Benedict Arnold V, the Traitor, may be closer. By DNA testing, we discovered our maternal uncle on the Joslin line had his closest match to one Westcott Campbell Joslin, Sr. Your author is still researching that line to determine our Shared Ancestor and, perhaps, break down the brick wall that still exists between William “P.R.” Joslin and the Colonel William (of Deerfield) Joslin. For it is our belief that P. R. was the grandson, not the son. When and if we chip away successfully at that wall, it is believed the Shared Ancestor with Westcott Campbell Joslin will provide the parental line that is missing – that ONE generation. Clearly, Westcott was named for his Westcott relatives, but we have yet to ascertain exactly how that interrelates to our line. Next month, we cover the Arnold Family – the heroes. That line intersects directly with my husband’s, Rod Cohenour. It should be interesting! Well, it's the Fall season, Halloween just past and Thanksgiving just around the corner. My better half and I have been scratching our heads trying to figure out great new desserts. Our challenge? To find a recipe with no eggs to accommodate a nephew with severe egg allergies. 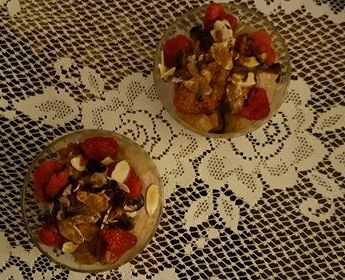 We played around for awhile and came up with an absolutely fabulous dessert: Chocolate Raspberry Mousse that will knock your socks off! Most chocolate mousse desserts are based on a frothy mixture of rich chocolate thickened with egg yolks beaten to a creamy blend with melted butter using egg whites whipped to firm peaks to fold into the mousse. This would not work for our needs. My sweet mate did her research, then reached into her old recipe box to create a good way to achieve the rich flavor, the foamy texture, and a diverse blend of tastes to excite both the eyes and the palate. I think she did a great job. One source of inspiration came from a blog that featured a traditional chocolate mousse enriched with espresso. If you can add espresso, surely you can add raspberry puree, right? 2. Fresh raspberries: Place half in saucepan with sugar, cook and stir until they break down into a puree. Put puree through strainer to remove all seeds. Save best raspberries for garnish. 3. OR Frozen sweetened raspberries: Thaw, strain to remove all seeds. Retain all pureed berries, mashing if necessary. Save best berries for garnish. 4. Melt chocolate chips or pieces in microwave with small amount of milk. Stir occasionally. When melted stir in raspberry puree and almond extract. Set aside. 5. Remove slightly frozen evaporated milk, bowl and beaters from freezer. Beat evaporated milk in large mixing bowl. It will whip like whipped cream and will almost triple in volume so be sure to use your large mixing bowl. After beating with chilled beaters for about 30 seconds, add half of powdered sugar and 1 tsp almond extract. (Powdered sugar contains a small amount of cornstarch which helps to firm up the whipped cream.) Evaporated milk should whip to form firm, soft peaks and resemble a good whipped cream. Jell-O should be just set and neither hard nor watery. Begin adding small amounts of the Jell-O to whipped evaporated milk. Continue until all has been added. Set this in fridge until ready to fold in chocolate mixture. 6. Chocolate-raspberry-almond mixture should still be warm. If not, microwave until just warm. Whip softened cream cheese and fold into chocolate mixture. 7. Now fold chocolate almond mixture into Jell-O/whipped evaporated milk mixture. When beautifully blended, spoon into parfait glasses. Sprinkle lightly with ground cinnamon. 8. Garnish with fresh raspberries, drizzle with chocolate sauce. Sprinkle toasted slivered almonds on top. Serve chilled or warm, but only garnish just before serving. Look for us in December! See pic below. my light shining a steady stream. stole my heart. They came home. unconditional love steamed the dream. helped me remember who he is. there was this lonely horse all alone. I cried many a tear when I passed his shed. “ I felt your love everyday. was remembered, felt and cherished. shines thru the sun, and rains gently on our souls. we were all filled with love. Someone posted the pic, I wrote this story.. The little birdie wrapped her claws around the frozen twig. The air was crisp, and the sky was blue. 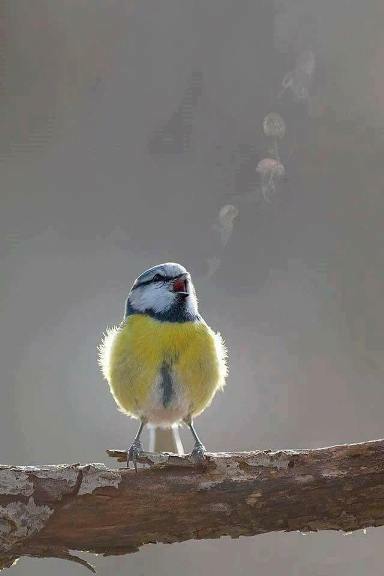 She took a breath and started to sing. Her trill formed puffs of mist, thus all could SEE her song. She sang and sang all the tunes she knew, encouraging us to become aware. “The dead don’t hide the truth and they never lie. Through me they can speak." - Dr Richard Shepherd. London born Dr Richard Shepherd is the forensic pathologist in the UK, who investigates and solves mysteries of unexplained or sudden death. He is a visiting professor at City University London, Honorary Consultant at The Royal Liverpool Hospital and a registered UK Home Office Forensic Pathologist. He has been involved in the investigation of many high profile deaths He advised on the management of UK fatalities following 9/11, and was the forensic pathologist expert for the Bloody Sunday Inquiry and the death of Diana, Princess of Wales. He is a member of the Ministerial Independent Advisory Panel on Deaths in Custody and also of the Restraint Accreditation Board, and has been a member of the Criminal Injuries Compensation Appeals Panel. He appears on Channel Five's Autopsy, where he investigates the mystery and intrigue behind the deaths of high profile celebrities such as Michael Jackson and Michael Hutchence. His first book Unnatural Causes was published, by Penguin, in September. In it he brings the reader on a, step by step, journey through his career. His literary prowess is evident from page 1, where he mentions the North Downs, “ . . .bearing an odd similarity to the rise and fall of the human body.” In almost every one of the 392 pages I asked myself why this wordsmith waited until he was sixty five to write his first book. He first became interested in “bodies” at age thirteen when a book was smuggled into his school. Yes. I know what you’re thinking! But. . . No. The book was a textbook on forensic medicine and the young Richard was immediately hooked. Dr Shepherd has faced serial killers, natural disaster, 'perfect murders' and freak accidents, all in the pursuit of the truth. And while he's been involved in some of the most high-profile cases of recent times, it's often the less well-known encounters that prove the most perplexing, intriguing and even bizarre. Like Rumpole of the Bailey, I’m sure, he at times annoyed his spouse at home in the kitchen while carrying out experiments on joints of meat. "I didn't stab every Sunday roast with a variety of knives, but the children definitely did see me do it sometimes," he once said. Laurence J. Peter said, "Before publisher’s blurbs were invented, authors had to make their reputations by writing.” Perhaps he was right. 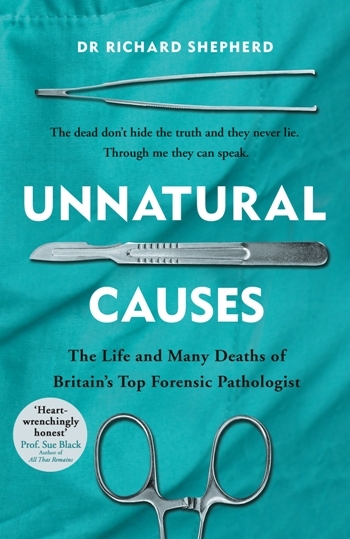 The blurb on this book states, "Unnatural Causes is an unputdownable record of an extraordinary life, a unique insight into a remarkable profession, and above all a powerful and reassuring testament to lives cut short.” This is an understatement, in the words of a more able interviewer than I , "Dr Shepherd , ” . . . 'Puts the reader at his elbow as he wields the scalpel'." A reporter from East coast radio was interviewing an 80 year old west Wicklow woman who had just got married for the fourth time. The interviewer asked her numerous questions about her life and about what it was like to be married again at 80 and then about her new husband’s occupation. “He’s a funeral undertaker”, she said. The newsman became very interested and asked her about her first three husbands and what they did for a living. She paused, smiled and told him that she had married a banker in her twenties, a circus ringmaster in her forties and a preacher in her sixties. A Warsaw man who was married to a Wicklow woman felt that a meeting with the local undertaker was imminent. He believed that his wife had poisoned him when he found, on her dressing-table, a small empty bottle bearing the label, POLISH REMOVER. Lisdoonvarna, County Clare is famous for its annual Matchmaking Festival. It is the location where, in many people’s lives, love-stories began. 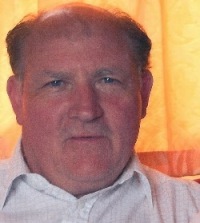 Now Dublin author and poet Michael Lacey, currently living in Lisdoonvarna, has taken the matchmaking to a new level. 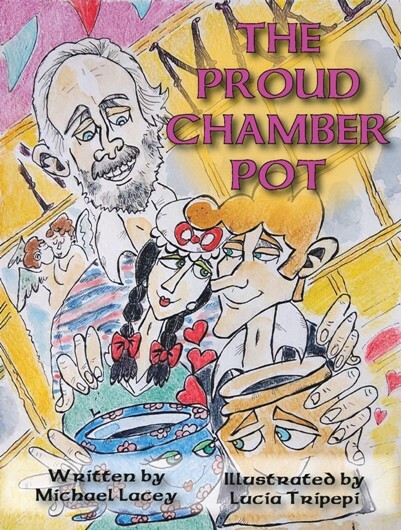 In his latest publication "The Proud Chamber Pot" he matches up a chamber pot named Helaine with a jam pot called Sam. I won’t spoil it for you with any more details because you see this is actually a children’s story. It is beautifully illustrated by Italian artist Lucia Tripepi. 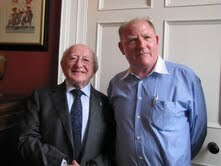 I am delighted to report that Michael D. Higgins will be our president for another seven years. He was my step-mother’s brother and no one really liked him. He was mean, bad tempered and consistently unpleasant, but he worked hard at his job to keep his long-suffering wife and three young children well fed and healthy. His name was Richard, and I called him Uncle Richie and like everyone else I avoided him whenever I could. He’s been gone for decades now, as has his sweet wife Dot. But I now have a huge amount of respect and admiration for that man because when his country called, he went off to fight in WW II, leaving his family in the care of his ageing parents. Uncle Richie was in a glider plane somewhere over Germany in the darkest days of that terrible war, and was shot down.The enemy fire came straight up through the underbelly of the glider with some bullets landing in Uncle Richie’s upper thigh, seriously shattering his femur. As luck would have it he survived the glider crash and was rescued by his American compatriots. In terrible agony he was immediately taken to a make-shift hospital where they patched him together and told him he’d be sent home. Uncle Ritchie wanted to stay and fight but was unable to walk and so was of no use to his comrades in arms.So back he went to a state-side hospital near his anxious family and was confined to a bed, in traction.He was told the broken bone may or may not knit together, so he must not move. I occasionally went to see Uncle Richie when I could catch a ride to the hospital, and I remember being amazed at the man’s patience.There was no TV back then of course but at least he had a small radio next to his bed where he could hear his beloved Red Barber broadcast the Brooklyn Dodgers games. Uncle Richie had lost a lot of his sharp edge because of his war experiences and would actually chat with me as he lay there, his grotesquely injured leg suspended in the air.I recall it appearing yellow and wet, greasy, and covered in plaster and gauze and it had a terrible odor. I asked him how he managed the boredom and he said he read a lot, dictated letters to the nurses and that he was being taught to knit.Knit! I remember thinking this was a woman’s thing to do (that’s how it was back then) but I didn’t say it. And one day I visited the ward and all the wounded WW II men in there were knitting, and really enjoying it.They were chatting and laughing as they lay there healing from the terrible wounds they’d received while fighting for a cause in which they dearly believed. I remember thinking that perhaps these shattered men could maybe be happy again. Uncle Richie got quite good at knitting and took lessons from the nurses without ever being crabby, and they obviously liked him.He made beautiful sweaters for his family, even in intricate Irish knit patterns. I don’t know who supplied the wool (back then it was called “wool” and not “yarn”) but the men had enough to keep on knitting beautiful garments until they were able to leave the hospital or until they died, and many did. But not Uncle Richie. After five long years the doctors told him his bone had healed well enough for his wife Dot to take him home for good, and so she did. He would need crutches for the rest of his life, they told him, but it turned out they were wrong. Uncle Richie was home for one week when he tripped over a hanger left on the floor, fell and rebroke that fragile bone.He knew in the ambulance that when he next came home he’d be without the leg they’d all tried so hard to save. Uncle Richie took great pleasure in showing us his “wooden leg” over the years, laughing when he used thumb tacks to hold his sock up. He found it to be hilariously funny to have that leg with shoe and sock propped up in the corner during their dinner or Bridge parties. We all knew the leg was painful to wear and his limp was pronounced and awful and his gait very slow when he did wear it, but he struggled along on just a cane and sometimes he didn’t even use that. He loved to garden and did not mind dragging himself around his small yard on his stomach by his elbows to put in his plants and to pull the weeds. Uncle Richie never knitted again but surprisingly became a talented jewelry maker.Lying for so long in that hospital had taught him great patience and his jewelry pieces were beautiful, intricate and in great demand. All this mellowed Uncle Richie to an extent.He still had his moments of temper, but not as often.He was to be forgiven however, because he went Over There and fought and did what he thought was right.He believed in what he and his war buddies went to do. He never complained, not ever.Uncle Richie was always a proud United States Veteran of World War II.I will never be able to comprehend how much he suffered, but I know I will always be proud of him. Not really sure how I got this. It's been told many people get this. seems to be lessening to some degree, so it must be working. Anyone for Tennis? Forget it, I'm taking up Ping Pong. In places food might be. Every hair into its spot. As we naked apes can claim. We may feel at end of year. waste time worrying about it. So I might tread this beauty. Will not be treated so. Let me not leave my space of ground untilled. Can do my portion that I leave undone. Hallowe’en was so different back in the Mesozoic Era when I was a kid.I know everyone my age says that, but since you’re the one reading this, let’s you and I take a late October stroll down memory lane together and remember those days. Wanna? Me too. For one thing, we actually dunked for apples. As I think back on that action I get a kind of eeeuuw feeling—all of us kids ducking our gross faces into a giant tub of water with floating apples to try to snag one for a promised prize, with just our teeth. The kids who hadn’t gotten braces yet on their Bugs Bunny incisors usually won that one although the rest of us complained loudly about the unfairness of it all. I had (and still do have) semi buck teeth and so learned how to shove an apple against the side of the cauldron and snag it before I drowned, and would happily haul it up and out harpooned on my front teeth, hair and shirts dripping, gakking up water and apple, all to win a bag of stale corn candies obviously saved from last year. But, after all is said and done, it really was fun. Then the parents had another apple game. What was it with all those apples back then? Oh yeah, it was apple season. This time the apples were suspended on long strings from a door frame and we kids, hands behind us, had to grab the fruit with just our teeth. Again, the pre-braces adolescents won that one hands,OK teeth, down. They just butted the apple until it swung hard and they pierced it in midair with those large teeth. Again first prize was another bag of stale candy corn. Next on the list of hilarious fun? Guessing how many marshmallows were stuffed into a big jar. The kid who guessed the closest won the marshmallows. Back in the day, sugar was supposed to be good for you, remember? We were expected to eat a whole lot of it so we’d have energy. Ah, those sweet-laden halcyon years.I sorely miss them. And oh, the crème de la crème of Hallowe’en night games was for all the kids to be blindfolded and certain things were placed beneath our noses. The one who could sniff the identity of the greatest number of those things got the best prize of all —a dollar! Some of the things under our noses would be peppermint, banana, peanutbutter, lemon, dirt, Palmolive soap, Jergen’s lotion, liver, rope, paint, Brylcreem, Dad’s Cutty Sark, an onion, Mom’s Sherry, coffee, Uncle Charlie’s beer, Rinso, and more. By the time I’d inhaled the aroma of all of those items I quite nearly –- well, I’m sure you know. I held it in. But all these years later, I still remember how oddly difficult it was to identify those every-day things while blindfolded. Oh, did I mention we were in costume? We were, and some of us were pretty creative. Lots of old sheets with holes in them so we could see and breathe of course. We wore our grandfather’s top hats and old tuxedoes, our grandmother’s old evening gowns and flowered hats, and we covered our faces with make-up and our necks and arms with costume jewelry. We made up clown outfits and put on our father’s old military uniforms---anything at all would make a good costume, only they all had to be made from things we already owned, and we worked on them for weeks. Buying costumes? Totally unheard of. Back then we weren’t “kids wearing costumes”---we were “ragamuffins” which are defined as persons in ragged and dirty clothing. The definition had evolved into kids who wore crazy costumes for Hallowe’en. A parade down Maine Street in the afternoon would have been arranged and we proudly marched, all secretly certain our home-made costumes were better than everyone else’s. The best one, decided upon by a small group of extremely cranky adults, was rewarded with a free dinner at the local hamburger joint and a whole lot of furious glares and “I’m gonna getchu” mutterings from the other contestants. And while we all understood that Hallowe’en was supposed to be deliciously scary, no one costumed themselves with plastic hatchets stuck in our skulls, or bloody swords piercing our hearts or as flesh devouring Zombies or famous serial killers or walking-talking-screaming tombstones or dripping bloody-toothed Great White Sharks, or murderous space aliens. Nor did anyone wear horrifying realistic rubber face masks one could not see out of or breathe into. I guess our costumes back then by comparison were pretty bland. We youngsters also didn’t take gigantic empty pails and pillow cases out into the ‘hood to get filled with candy after ringing a doorbell and demanding largesse. No, back in our day, if you wanted a reward, you had to do a trick to get the booty, and it could be almost anything. Non-destructive anything that is. Dancing, reciting a poem, showing cat-in-the-cradle string tricks, reciting the times tables, especially the 9 ones, reciting the Gettysburg Address, stuff like that. For reasons I’ll never fully understand, I’d confront the families in their doorways holding the candy, or doughnuts, lollypops or whatever, and I’d sing “I’m Dreaming of a White Christmas” to them.I was cute and curly-headed back then, and really milked it, letting my not-so-great singing voice wobble endearingly while grinning up at the adults with what I just knew was my most adorable Huckleberry Finn buck-toothed smile. It all paid off—these kind folks would listen to my warblings all the way to “And may all your Christmases be whiiiiiiiite!” (A tiny sob here worked well. )I’d be rewarded with taffy or chocolate kisses or Chiclets, and yes, more apples. But best of all were the Indian Head pennies those kind folks gave out. Oh how I wish I’d saved those. Had I done so, I’d be living in ----well somewhere expensive. And warm. We never did any damage to homes or cars, except for soaping a few windows and maybe wrapping just one roll of TP around a tree or shed or something. Shooting out street lights with Daisy Air Rifles was for Juvenile Delinquents, but not us. Oh no. Some parents made their children give up their candy to kids in hospitals, but the smart ones hid a stash somewhere—pockets, an old tree trunk, shoes or boots. Not that they didn’t want to be kind to kids in the hospital, but they reasoned if those kids were sick they probably should not have been fed candy anyway, so they were actually doing them a kindness. We’d then head finally for our respective homes, exhausted and happy, and we’d put our ragamuffin outfits in a box in the attic for next year, even knowing we might be too big for them the following October. And we secretly feared we might eventually even be too big ourselves for any beloved Hallowe’en shenanigans. But never in our hearts. No, never in our hearts. Contact LC at lcvs@comcast.net. Her newest book “Queenie” is at local bookstores and on Amazon. About 10 years ago I had a job which required an hour commute downtown by train one way, and an hour back. I would usually use this time to meditate, pray (silently), ponder etc. One day about a third of the way into my trip, I had my head bowed in silent prayer. As far as anyone around me knew, I was probably napping. After finishing prayer I would usually visualize drawing in all the positive energy I possibly could and then image that what ever my spirit didn't absorb of the energy I would shoot out around me to all those in my physical area to be able to enjoy. A woman came into the train at the 1/3 point and of course, even in prayer one can take in background noise etc. She sat directly behind me, back to back. As the train rolled along various people would try to interact with her but would be met with some odd remark or behavior that would cause them to find other seating. So at the end of my prayers and visualizing, I did what I usually do; imaged shooting out any excess positive energy to those around me. As I did this, I heard this woman behind me say, "Stop it! You're burning me!" No one on the train had a clue as to whom she was addressing. At that point I didn't know it was me but I thought, 'I wonder?' .....since it happened almost simultaneously with me sending out positive energy, 'if it might have BEEN me'. So I decide, being curious, to do it again and see if the same reaction would happen and indeed it DID. Now mind you, the woman did not look at me, didn't change positions to address me, didn't move in any way other than to once again yell out, "STOP IT! YOU ARE BURNING ME". Now I was close to being convinced that it probably was me, but to be absolutely sure I did it one more time and once again, came the same reaction but more loudly and forcefully. I was sure that in my putting positive energy out there, it was affecting her, it had to be, because she'd react each time at only that time. Eventually her stop came which was just before my own and since she never even looked at me or addressed me I was highly curious and got off at her stop. I was walking about 2 yards behind her and again, she didn't see me get off the train, and didn't look behind her at all but was screaming, "Don't FOLLOW ME!!!" I knew it was addressed to me, and as I quickened my pace she also yelled out that I had "Better not BURN her again". So, I ran ahead of her to actually get a look at her face (Yes, only me, most people would run AWAY but "I" chase the crazy down lol) Her eyes were literally spinning in opposite directions in her head. As soon as I saw it I knew I had looked into the face a possessed person. I had no question about it in my mind. Having satisfied my curiosity, I hung back and watched as she crossed the street. I have no idea what her destination was and I wished I had the time to have continued to watch her and her behavior but I had to get into work. That it is very difficult for evil to exist in positive energy. It literally creates a burning sensation. Knowing that God is in Glory (a place) I realized that the more we lived a life close to the spirit and our values, the more 'light' (Gods love equals light) we can hold or withstand. God stays in one place but where we end up depends on 'how' we live. Those who don't live up to the values we know to be true, honesty, integrity, love, kindness, compassion, etc etc aren't able to stand in the presence of God because they would literally feel a 'burning sensation'.......which would explain why the bible describes Hell, as fire and brimstone. The more you live outside of which you know to be good and true, the further it takes you from being able to stand in the presence of the divine ie: therefore darkness the absence of light. The more we develop our light in living our values the more we are capable of containing and being 'in' communion with that light. This is why the entity inside that woman was not able to endure the positive light energy I was sending out. Now we all know people, who just kind of glow, who really carry 'light' around with them, it just radiates and exudes. They are in a positive place, living true to their values and getting a clear channel to the divine. And conversely we have all seen people who just seem to be dark, have no soul behind their eyes.....and that doesn't mean they are possessed, just not living to the optimum of truth as they know it. Possession is different. When I looked into the face of that woman, the thought enveloped me, in the way I've learned to know truth, that she was possessed, that there was an entity inside her that didn't belong. There are entities in our earth experience who do want the experience of using our bodies for their means. It is my belief that the more we live outside of truth the more we leave ourselves susceptible (sort of hole in the protection around our souls or the thinning of it) for this dilemma to occur. It's hard for me to say that it can happen without our consent. In the case of the woman I encountered I felt like she 'allowed' the entity domain over her body. I don't know why, but that's what came to me. I do feel the possibility exists for it to happen beyond our control but I can't say and don't know how it would be possible or what causes it to happen. I think those would be very very rare cases. Also, having the psych background I do, I acknowledge that a lot of mental illness is mistakenly attributed to possession. It's been less than 100 years since people considered retardation demonic possession and we've come a long way and there are still many mental illnesses for which we have no direct diagnoses, that again, could be easily written off as possession. However, my experience on that train that day does have me 'knowing' that there are demonic entities ready and waiting for the right unfortunate circumstances to take over physical bodies. Moral of the story, live your life to that which you know to be positive, pure, good and true is the best way to avoid any kind of difficulty with these matters as well as being able to grow and expand in our own spirituality and closeness with the divine. ©Bunny Dunn. Used with the author's permission.